I don't think we can solve humanity's manifold problems by voting for a new president. Arguably, nobody will make a much better president, than anyone up for the job. And that nobody is each of us; we need no more leaders, save the people themselves. Hence my goal in writing this article is to empower the individual to play their part in awakening the masses. Presidential elections are an excellent way of gauging collective consciousness as well as keeping an eye on our would-be masters. And if we are really good at observation, they can actually tell us exactly what we need to say in order to appeal to the sleeping masses, and rouse them out of their slumber. The reason why is elections are a way for the insurgents that run government, not just in the United States, but elsewhere, to gain the consent of the people to be governed. In order to do this, there is a modest level of communication by the cabal in appealing to desires of the masses. The resulting exchange is a candidate whose campaign that pulls the heartstrings of the people in a manipulative way. So why is this important to pay attention to? It lets us know what the people, overall, care about, what they have an interest in; it lets us know the psychology of who we are trying to appeal to. The candidate needs to know who he is talking to and what they want so that he can shape rhetoric to appeal to them. 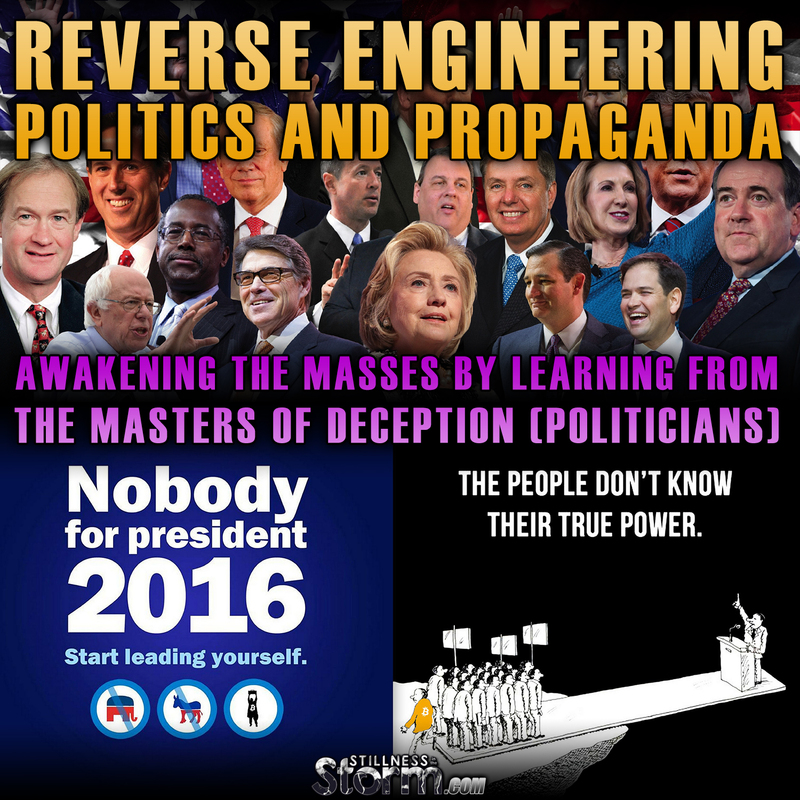 While the intention of most politicians is deceptive, the methods employed are something we can learn from. Our world is ravaged by chaos, harm, and tyranny primarily because the people on it have lost touch with reality. Propaganda or reality management techniques shape the viewpoints of our fellows, allowing them to be deceived into accepting slavery under the guise of freedom. The United States is an excellent example of a well trained, almost totally enslaved population that actually considers itself to be free, despite the sobering truth. In the effort to wrestle back our world from the clutches of darkness, the battles for freedom, truth and goodness are waged in the hearts and minds of the people. The cabal knows this all too well, as they seek to tame this sleeping giant of humanity by peddling dependency, fear and intimidation to the masses. The 'War on Terra' is a battle for what you believe or accept as truth. They tell us the world is a cruel terrifying place, where bad people who hate us want to cause harm and destroy what we care about. They tell us that life is a grand cosmic accident and the only thing that seems to make sense for each of us to clamor over each other in an effort to become rich and popular. The tell us life is so random and chaotic that seeking for meaning is a fruitless effort. Only from this picture of disempowerment and confusion will an individual choose ignorance and enslavement over freedom and responsibility. Only from within this false sense of reality can the trappings of a control matrix actually sound appealing. In a very real sense, the cabal campaign about all these things and more during election times. The goal is to make life seem so insurmountable, that only our trusted experts and leaders can handle the task, which are then paraded before us as electoral candidates. We think we are making a choice for a better future, by voting for this or that, all the while, we are playing our part as hapless dupes and pawns perfectly. The good news is that these same techniques for shaping a person's reality can also be used for good. For the truth has the power to shatter even the most well-crafted deception. While the cabal campaign for more dependency or authority, we who recognize what is can campaign for truth, love and freedom. And this is why paying attention to elections is so powerful, because the concerns and attitudes of the people, which are normally hidden from sight, are actually spoken to, on mass, during election times. For example, Ted Cruz has connections to Henry Kissinger, who is one of the most well known Cabal agents. Cruz is a masterfully sculpted candidate who demonstrates a level of emotional disconnect clearly indicating a sociopathic or even psychopathic personality, exactly what the NWO agenda needs. During the GOP race, Cruz used talking points to address Tea Party members, and reformists in general, saying that 'government has grown too big and needs to be cut back.' He even jumped on to the audit the Fed bandwagon during the GOP debates, clearly addressing those who have some semblance of awareness about this institution's criminal actions. Yet when Cruz was given the chance to vote for an audit the Fed bill, he was suspiciously absent. The duplicity aside for the moment, the point here, is that politicians speak to issues people care about. They campaign by acknowledging a person's concerns and then twisting those genuine desires into something that can be used for the globalist agenda. While freedom loving people need not resort to such dishonorable techniques, we can take a page out of their playbook. The Cabal are adept at listening to the people and tailoring their messages so that people feel as if their personal issues are being addressed. 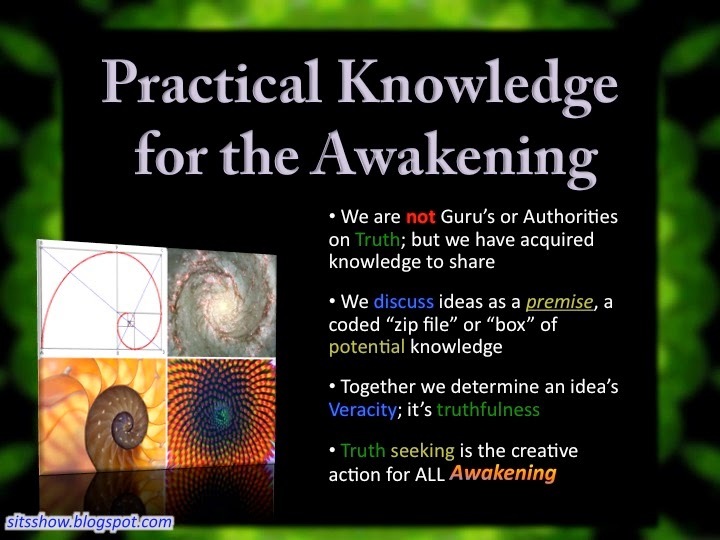 We in the awakening community can do the same, accept we will actually want to do something to make a real difference. We know that deep down, people just want the freedom to search for meaning in their own lives and attain some measure of prosperity. We know that people generally want to be healthy, abundant and live their lives free of manipulation. And we know that the whole truth has been kept from the people so as to distort their perception of reality, what I call reality management. Here are ere's some facts that came right out of the election process, which confirm the aforementioned common goals shared by all people. This is essential intelligence for the would-be controllers so they can campaign effectively for their agenda, as such, it can be used for our purposes in making the world a better place. These data tell us that the American people are very unhappy with their government and are almost at a tipping point for revolting against it. The country [is] in a prerevolutionary moment. This election could mark the beginning of the end of two-party duopoly in the United States. The power elite asks, “When will this be over?” Although this is seen as a chaotic and temporary situation by most of the political and media establishment, our research shows a strong, evolving tidal wave of discontent and growing pressure for real and dramatic change. Real change is what that the establishment fears most and fights hardest against. It is ultimately a losing battle. This, in fact, is a revolution. "... but between mainstream America and the ruling political elites of incumbent politicians, lobbyists, big business, big unions, big banks, big special interests and the big media." This kind of information is like strategic intelligence, it helps those with operational directives to shape their plans for the best success. The operation here is freedom, the operatives in the field are those who are reading these words right now, those who see that change is needed and are willing to do something about it. These data tell us that the people are ready to make a leap of faith. They are ready to abandon the status quo and take actions towards greater change. The people are waking up. But our work is only beginning. While these numbers indicate a population that is almost completely dissatisfied with the present state of affairs, this same population is almost completely incapable of taking actions to realize change. Why? Because they lack knowledge, their reality has been managed to such an extent, they simply don't know who to do anything else but be enslaved, harsh as that may sound. Recognizing that something is wrong is the first step, actually knowing what one can do to positively change the situation for the better is another matter. The people have been too downtrodden by distraction, earning a living and life, in general, to spend time educating themselves. As such, those of us who have taken the time to gain key knowledge and understanding, especially about growing clean organic food, building sustainable infrastructure, and developing honorable systems of commerce and trade are needed now more than ever. The sleeping masses are ready to seek out a way to make this world a better place, and like a good politician, we can listen to what they have to say and shape our truth dissemination efforts into answers open minds want to know. Instead of using politics as a tool for manipulation, we can learn from these masters of articulation and attenuation to speak to the hearts of the people. In my view, this election has already show us that the people are ready for real change. Donald Trump's win of the New Hampshire primary, by an overwhelming majority, despite being blacklisted by the mainstream media, indicates that the propaganda machine his loosing its grip on the minds of the masses. Related Rubicon Moment: Trump Wild Card vs Establishment | BIlderberg Group and Top Level Marketer to the Elite, Thinks: It Doesn't Matter about Trump, "Hillary Will Win"
To be clear, I am not saying the solution to our problems is voting for any candidiate. But I am saying that the whole election process brings to the surface values of people that we can appeal to in our efforts to create a free and prosperous world. And by all accounts, the people are so disillusioned with their governments, that we most likely have the best chance for success, now more than ever. Change really is on the horizon, that's undeniable. But what remains uncertain is what the final outcome will be. Let's keep seeking truth, speaking truth, and acting in truth in all ways possible so that we embody the change wish to see in the world with each breath we take. As one final data point in this whole discussion, see the following article which clearly shows which candidates are being funded by the cabal, Jeb Bush, Hillary Clinton and Ted Cruz. And with this data in mind, listen to what these candidates have to say, because they are speaking to the people, and so can we. 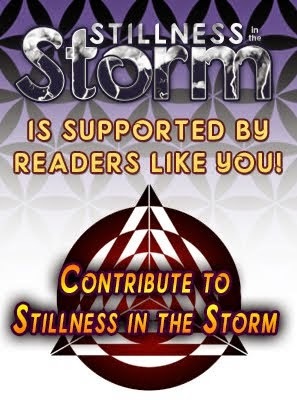 The preceding article is a Stillness in the Storm original creation. Please share widely. According to the Center for Responsive Politics, Wall Street or the securities and investment industry dominates the campaign contribution money race, having given $102 million to the 2016 presidential candidates and their super PACs. Still think there's a difference between Democrats and Republicans? Still think Ted Cruz and Marco Rubio are for the "little guy"? Donald Trump has received the least amount of money from Wall Street and, therefore, is the least beholden to Goldman Sachs, et al. On January 12, 2016, the Federal Reserve Transparency Act – a bill that would have given Congress the authority to audit the Federal Reserve – fell 7 votes shy of clearing the 60-vote threshold needed to advance out of the chamber. The vote was 53-44. The 44 senators who voted "No" are all Democrats. Spearheaded by Sen. Rand Paul (R-KY), the bill, if passed, would have expanded oversight over the central bank and, for the first time, empowered the Government Accountability Office to audit the Federal Reserve. Rand Paul (R-KY), Marco Rubio (R-FL), and Bernie Sanders (I-VT) voted "Yes". Ted Cruz (R-TX) initially said he would vote "Yes," but ended up not voting.